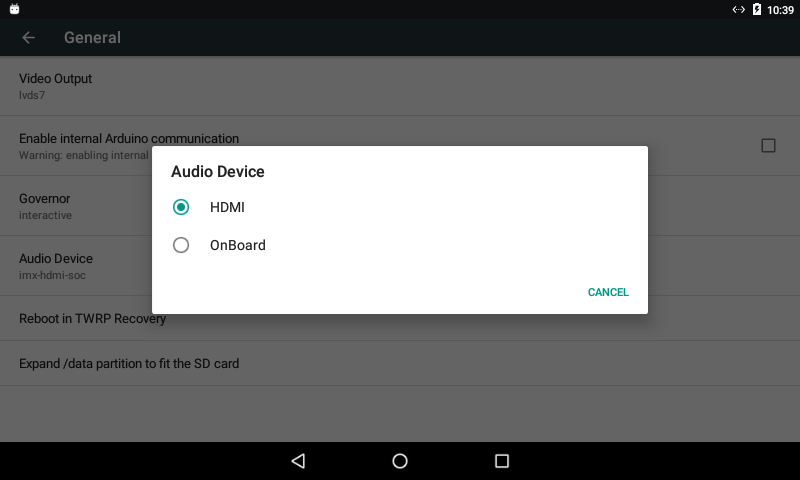 Since the 6.0 Marshmallow version, the UDOO Android distro comes with a custom UDOO section in Setting App to configure custom options for UDOO boards. In General you can find misc custom options to set video output, audio device, processor's governor, OTG communication and reboot Android in recovery. 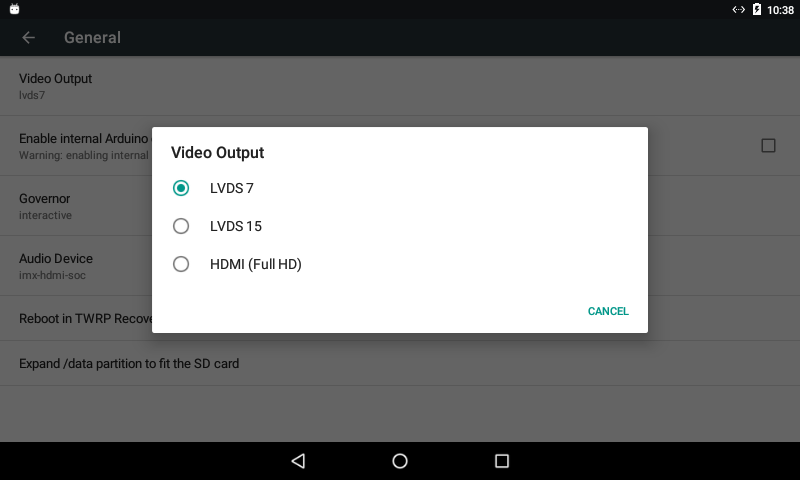 In UDOO QUAD/DUAL you have three options as video output. The default one at boot is HDMI. The external micro USB connector (CN3) to communicate through adb with an External PC exactly like you do with an Android smartphone/tablet. The UDOO's Arduino™ DUE processor USB Native port to make communicate an Android App and an Arduino sketch through ADK protocol. Visit the External OTG connection to i.MX6 and OTG connection between i.MX6 and SAM3X sections in the page i.MX6 and Sam3X Communication to find more info about. 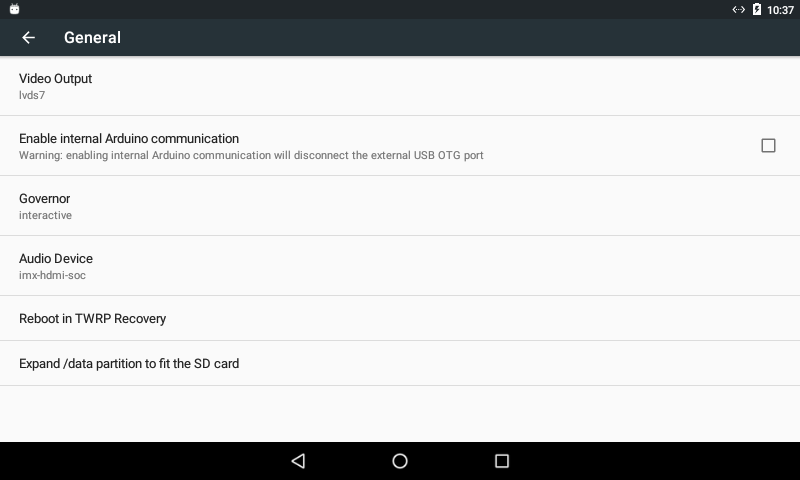 Since the 6.0 Marshmallow version the default option let UDOO's OTG bus communicate with and external PC (ADB). Check this option to make an Adroid App communicate with the UDOO's Arduino™ DUE processor. Visit the Switch Between Adb Debug and ADK Connection to find more info about how to change the iMX^ USB OTG physically connection. conservative: Dynamically switch between CPU(s) available if at 75% load. ondemand: Dynamically switch between CPU(s) available if at 95% cpu load. userspace:	Run the cpu at user specified frequencies. powersave:	Run the cpu at the minimum frequency. interactive: dynamically scales CPU clockspeed in response to the workload placed on the CPU by the user. Significantly more responsive than ondemand. performance:	Run the cpu at max frequency. OnBoard (vt1613-audio) : audio from the green speaker 3.5mm jack. You need to reboot Android to apply this change. Since Android 6.0 Marshmallow version the UDOO Android distro provides TWRP recovery. Booting Android in Recovery mode allow you to install zip update packages. 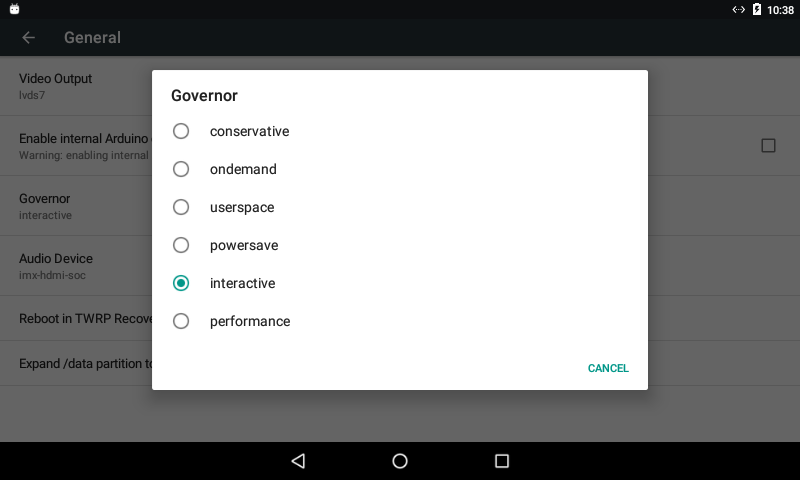 For example you can install the Open GApps packages to Google Play Services, Play Store and Google Apps. You can find an exhaustive guide of how to install Gapps here. Since Android 6.0.1 R2 you can expand the /data partition to fit the maximum space available on the microSD card. The UDOO Android image can be flashed on a Micro SD of at least 4 GB. The image is not expanded automatically and stuck at 4GB even if you use a bigger SD card; however you can expand your /data partition manually using this menu option.